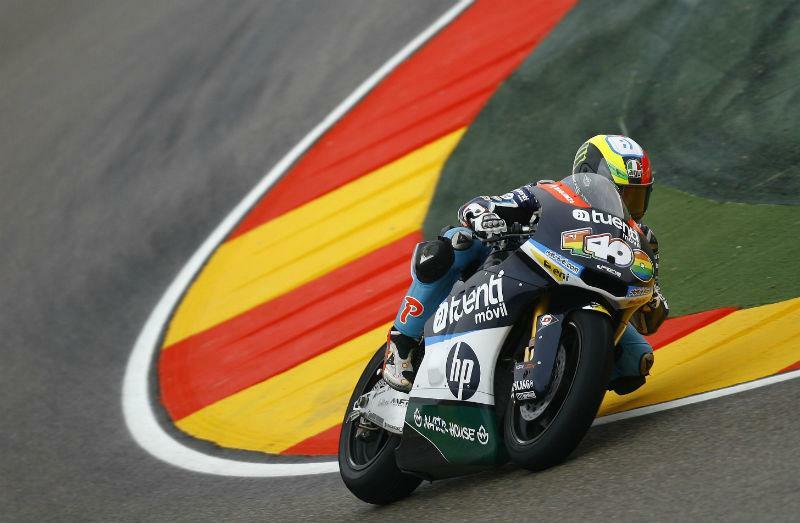 Pol Espargaro has taken his eighth pole position of the 2012 season with pole position at the final round of the 2012 season in Valencia despite a crash in the latter stages of the qualifying session. Newly crowned Moto2 champion Marc Marquez set the second fastest time of the session, but will start from the last spot on the grid as penalty for colliding with Simone Corsi during free practice 2. Thomas Luthi and Takaaki Nakagami complete the front row in second and third respectively. Brit Scott Redding will start from eighth on the grid. Bradley Smith, who moves upto MotoGP with the Tech 3 team in 2013 has struggled at the Spanish circuit and will start from 22nd on the grid. Gino Rea will start from 20th position.